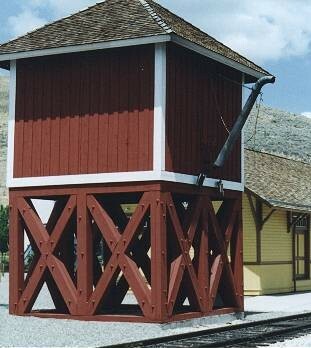 The water tower is a replica of the one that serviced the Virginia & Truckee Railroad at Franktown, Nevada. The V&T water tower stood at Franktown in the Washoe Valley until late 1983 when it was lowered to the ground because it had become unstable. The replica water tower, completed in 1987, is built to a two-thirds scale of the original V&T structure. The water tower with a 4500-gallon capacity is used by our steam trains.